-- American Express Pre-Sale Thursday, January 25 at 10 a.m.
-- Ticketmaster Verified Fan Pre-Sale Tuesday, January 30 At 10 a.m. 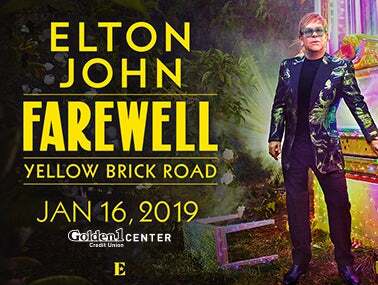 Kicking off in the U.S. on September 8, 2018, the ‘Farewell Yellow Brick Road’ tour will consist of more than 300 shows across five continents, with a stop in Sacramento at Golden 1 Center on January 16, 2019. These dates mark the superstar’s last-ever tour, the end of half a century on the road for one of pop culture’s most enduring performers. Elton’s new stage production will take his fans on a musical and highly visual journey spanning a 50-year career of hits like no one has ever seen before. The ‘Farewell Yellow Brick Road Tour’ pre-sale is powered by Ticketmaster Verified Fan (Ticketmaster’s fan-first technology, built to help artists combat ticket bots and get tickets into the hands of fans that intend to go to the event). Tickets for the tour will be available through registration using Ticketmaster Verified Fan. Registration opens Wednesday January 24 and continues until Saturday January 27. Pre-sale will begin Tuesday January 30 at 10 a.m. and run through Wednesday January 31 at 10 p.m. (all times are local); supplies are limited. Registration is required to participate in the TM Verified Fan Pre-sale. For more information and to register, visit EltonJohn.com. AEG Presents is one of the largest live music companies in the world. The company is dedicated to all aspects of live contemporary music performances, including producing and promoting global and regional concert tours, music events and world-renowned festivals. AEG Presents operates in North America, Europe and Asia through 16 regional offices that support its tours which include such artists as Elton John, Taylor Swift, Paul McCartney, The Rolling Stones, Justin Bieber, Katy Perry and Kenny Chesney; produce or support over 40 music festivals, including the iconic Coachella Valley Music & Arts Festival; and owns, manages or books more than 80 clubs and theaters. AEG Presents produces and promotes more than 15,000 shows annually worldwide and conducts business under such globally renowned brands as AEG Presents, Goldenvoice, Concerts West, Messina Touring Group, Marshall Arts LTD, and Madison House Presents.